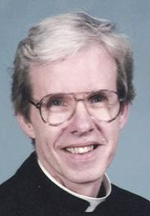 Father John (Jack) A. Fitzgibbons, 73, who began his ministry as an Augustinian and continued it as a diocesan priest, died at St. Martha’s Manor in Downingtown on Oct. 25. Born in Hartford, Conn., the son of the late John F. and Margaret L. (Porta) Fitzgibbons, he attended Kenelly Elementary School in Hartford, St. Denis School in Havertown and Msgr. Bonner High School before entering the Augustinian order. He was ordained Sept. 7, 1968 by Bishop Gerald V. McDevitt at St. Denis Church and among his assignments was St. Nicholas of Tolentine Parish in the Bronx, N.Y., where he taught at the former high school of the parish and is remembered as a brilliant, funny and wonderful person and teacher, with hundreds of former students sending condolences on his death, according to his brother, Dr. Richard Fitzgibbons. He was the eldest of five children in his family, and “we were all pleased that the Lord chose him to serve the church as a priest,” Dr. Fitzgibbons said. Other assignments as an Augustinian include graduate studies at Villanova University, parish ministry at Our Lady of Good Counsel Parish in Staten Island, back to St. Nicholas of Tolentine in the Bronx and then to St. Nicholas of Tolentine in Staten Island. He was incardinated into the Archdiocese of Philadelphia in 1983 and served as parochial vicar at St. Isaac Jogues, Wayne; St. Joseph the Worker, Fallsington; St. Laurence, Upper Darby; Good Shepherd, Philadelphia; Mater Dolorosa, Philadelphia; St. Dominic, Philadelphia; St. Anastasia, Newtown Square; St. George, Glenolden and Holy Spirit, Sharon Hill. He also served as a chaplain for the Holy Redeemer Health System. Bishop Robert P. Maginnis will celebrate a funeral Mass for Father Fitzgibbons at St. Colman Church, Ardmore, at 11 a.m. on Thursday, Nov. 5. Concelebrants include Msgr. Daniel J. Sullivan and Father Sherlock, who will be the homilist. In addition to his brother Richard (Adele) he is survived by his brother James (Margaret); his sisters Mary Jane Tadeo and Julia, and many nieces and nephews. Interment will be at Calvary Cemetery, Conshohocken.